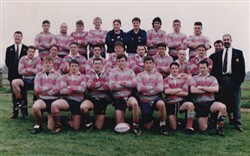 Colour photo of team in kit on benches. Players listed as: A Little, J Cox, G Dainty, R Mallen, A Ward, R Warren, S Lawrence, E Warren, R Demain, R Knapper, N Purcell, T Coe, R Blenkinsop, J Pizzario, P Hosker, M Chandler, R Gilbert, C Sudds, M Watts, D Terry, M Holloway (captain), G Hughes, N Austen, T Hinson. Team Manager: A Tebby, A Team Coach: R Davis, B Team Coach: G Sharp.